We are only halfway through January, but it doesn’t feel like a fresh start to the new year, now does it? From day one markets looked grim and sentiment turned severely negative. This January feels more like months of struggle, instead. The result? 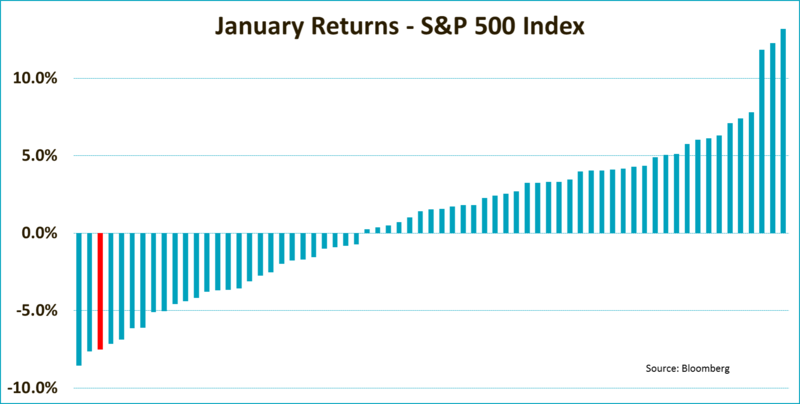 The S&P 500 Index is down more than 7% and if we call the end of January now, it would rank as the third worst starting month since 1950. So what does this mean for the rest of the year? Well, there is no real straightforward answer to that question. The good news is that the phrase ‘as goes January, as goes the year’, is mathematically untrue. 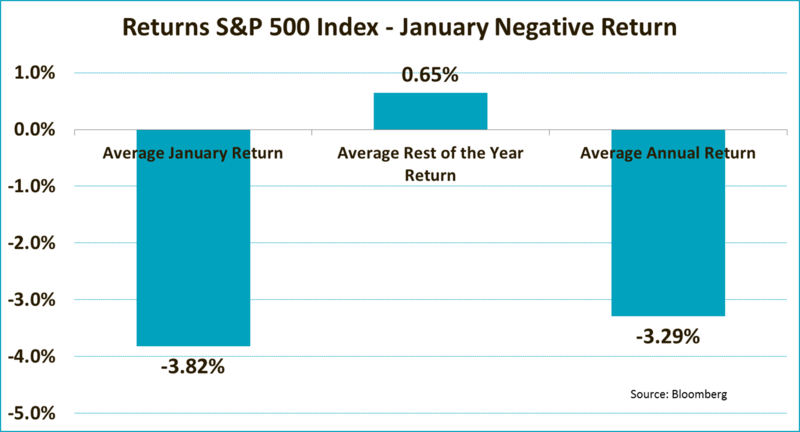 The table below shows that, on average, the S&P 500 Index managed to eek out a very limited positive return of 0.65% for the rest of the year if January yielded a negative return. Perhaps we should also take it as a positive that these ‘rest of the year’ returns are very scattered throughout time. So, based on historical returns we could still go up massively or go down even harder in the remainder of the year, as is shown in the graph below. But, there are some clear negatives as well. First, an average return of below 1% after January yields a negative return, is not really reassuring. On top of that, the opposite is true for for the years in which January gives us a positive return. In that case things really look upbeat. As the graph below shows, the average rest of the year return is a massive 12% if the first month is positive. 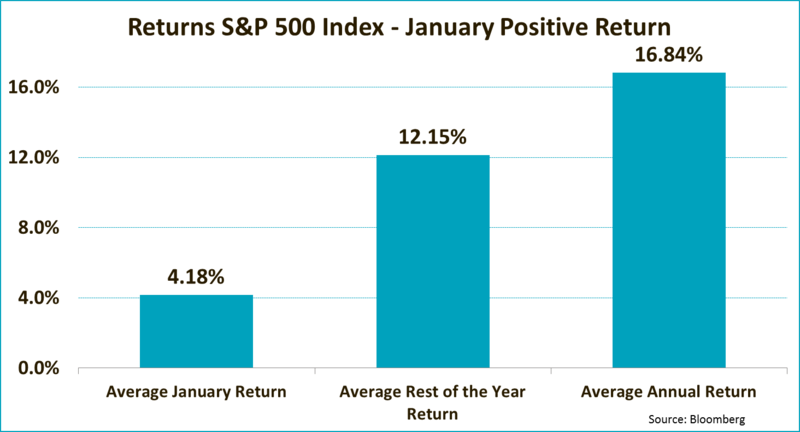 As the average of 12% already suggested, most of the rest of the year returns are in fact positive. 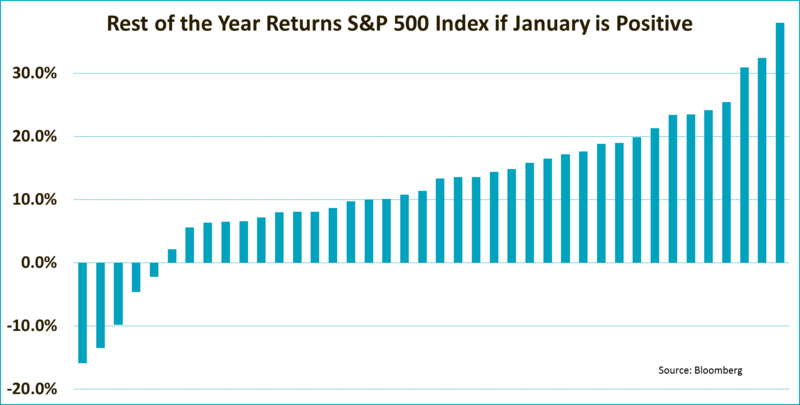 In just 5 cases out of the 40 years with a positive return in January did the rest of the year go south. That is a pretty reassuring statistic. 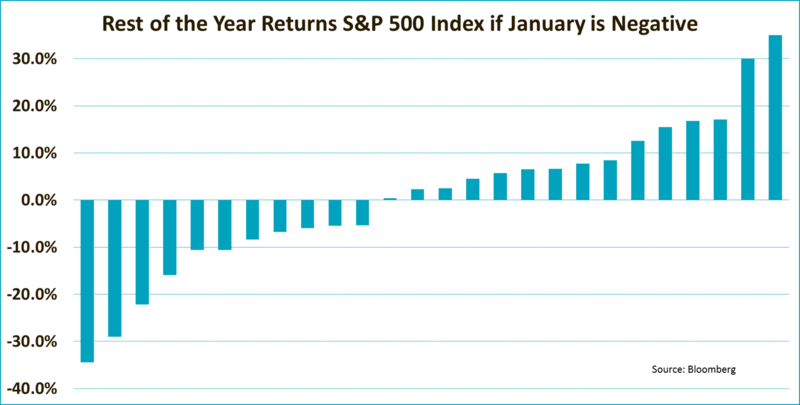 So, while we should surely not give up on stocks this year, as the second graph showed, a positive return in January would make thinks look a bit more compelling. Fortunately, January is only halfway.